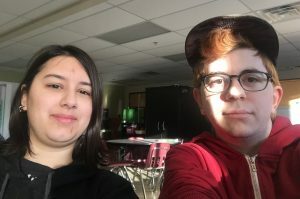 Katharina Orfanidis and Gabriel Internoscia have been students at NOVA since 2017 completing their Advanced Secondary IV and Secondary V Math and Science courses. Incredibly, they are also both students at Dawson College and have been studying at both schools simultaneously with the intention of transferring into Dawson’s Computer Science program. While diligently advancing through Secondary V math at NOVA, Katharina also successfully completed English and Humanities courses at Dawson this past semester, earning grades above 85% in all she studied. Gabriel successfully completed three courses at Dawson last semester (English, Humanities, and French) while effectively working through his Secondary V Advanced Math at NOVA, earning final grades all above 84%. We congratulate Katharina and Gabriel for their extraordinary work ethic and their perseverance while working towards their future goals. We are happy to report that Katharina and Gabriel are well on their way to completing their Advanced Secondary V Math at NOVA AND they have both started their first computer science course (Applications in Computer Science) at Dawson. Well done!